Salvatore Scarpitta is an artist. Prada presents “What Was I?”, a new exhibition project conceived by artist Goshka Macuga, with the support of Fondazione Prada. On view from 23 March to 2 June 2019, it will take place in the premises of Rong Zhai, a 1918 historical residence in Shanghai restored by Prada and reopened in October 2017. 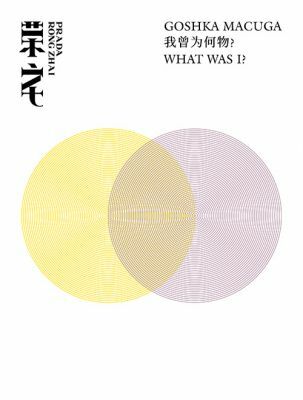 “What Was I?” is a kaleidoscopic journey in the post-Anthropocene epoch, after the collapse of humankind due to the effects of technological overdevelopment. The protagonist of this unexpected voyage is an android created by Macuga and produced in Japan by A Lab for the exhibition presented in 2016 at the Milan venue of Fondazione Prada. The android recites/rehearses his monologue constructed from numerous excerpts of seminal speeches, claiming himself to be a repository of human knowledge. In this futuristic scenario, where the human perspective is no longer valid, the android is the only inhabitant of Prada Rong Zhai and a discrete presence in the residence. The key and dramatic question: "What was I? ", that closes his enunciation and gives the title to a Macuga’s neon piece and to her new project, was originally pronounced by Frankenstein’s monster in the gothic novel written by Mary Shelley in 1818. In Macuga’s fictional and post-apocalyptic universe, the android occupies the rooms of the historical house, revealing his personal art collection and belongings: 26 works from the Prada Collection, including several Italian art masterpieces, from 1958 to 1993, as well as 3 recent paper collages by the artist, part of the series Discrete Model. A selection of works by artists related to the German Zero group and the Italian and French Programmed and Kinetic Art movement ⎯such as Jan Schoonhoven, Luis Tomasello, Grazia Varisco, and Nanda Vigo⎯ explores the complexity of computer-like patterns and geometric shapes and creates an autonomous alphabet of forms. The android is surrounded by a constellation of works by Italian artists: Enrico Castellani and Piero Manzoni, who attempted to reach a zero- pictorial language; Alberto Burri, Lucio Fontana, Francesco Lo Savio, Salvatore Scarpitta, Turi Simeti, and Giuseppe Uncini, who experimented in their works new ways to overcome the physical and symbolic limits of the canvas and employed unconventional materials that connected art to reality. Two unusual portraits by Walter De Maria and Llyn Foulkes remind the human body and its absence, while a painting by Vincenzo Agnetti evokes a “language beyond language”. A series of installations and small sculptures by Richard Artschwager, Peter Fischli & David Weiss, Mario Merz, Salvatore Scarpitta and Rachel Whiteread, incorporating common objects and functional elements, suggests a possible post-human daily routine. At the same time, these works contribute to shape a domestic context and an intimate habitat, in which the android can invent his own future “existence”. During the exhibition, the android’s speech will coexist with a live performance by a calligrapher. Taking place twice a week, it will aim at generating an alternative and written version of the original monologue by translating it from English to Chinese. Goshka Macuga was born in Warsaw and lives in London. She works across a variety of media including sculpture, installation, photography, architecture and design. Her artistic practice is often referred to as taking on the roles of an artist, curator, collector, researcher and exhibition designer. Macuga describes these categories that are often attached to her practice, as “predicating her position within, and making her part of, an art historical taxonomy”. Her recent solo and group shows include: “What Is Enlightenment: 200 Years of the University of Warsaw Library Print Collection”, The Museum of Modern Art, Warsaw (2018); “Hello World. Revising a Collection”, Hamburger Bahnhof– Museum für Gegenwart, Berlin (2018); “Like Life: Sculpture, Colour and the Body (1300-Now)”, The Met Breuer, New York (2018); “Goshka Macuga: Intellectual Co- Operation”, Neues Museum, Nüremberg (2017); “Goshka Macuga & Ahmet Ögüt Episode 1 and 2”, Witte de With Centre for Contemporary Art, Rotterdam (2017); “Now this, is this the end... the end of the beginning or the beginning of the end?” (part 1), Schinkel Pavilion, INDEX Berlin (2016); “Time as Fabric”, New Museum, New York (2016); “To the Son of Man Who Ate the Scroll”, Fondazione Prada, Milan (2016); “Public Address: Goshka Macuga Tapestries” at Lunds konsthall, Sweden (2014); “Exhibit, A” at the Museum of Contemporary Art, Chicago (2012); “Untitled” at the Zachęta National Gallery of Art, Warsaw (2011); “It Broke from Within” at the Walker Art Center, Minneapolis (2011); “The Nature of the Beast” at Whitechapel Gallery, London (2009); “I am Become Death” at Kunsthalle Basel (2009); and “Objects in Relation, Art Now” at Tate Britain, London (2007). She has realized new commissions for internationally acclaimed shows such as the Kochi Biennale (2018), dOCUMENTA (13) (2012), the Venice Art Biennale (2009), the Liverpool Biennial (2008), the Berlin Biennale (2008 and 2014), and the Bienal de São Paulo (2006). In 2008, she was nominated for the Turner Prize.